Master-quality audio, or MQA for short, is available as an option with a HiFi subscription, which costs $19.99 per month. Only a little over 150,000 tracks are streaming in the format -- each track plays at 96 kilohertz and 24 bits, whereas regular HiFi is in CD-quality FLAC, meaning 44.1 kilohertz and 16 bits. 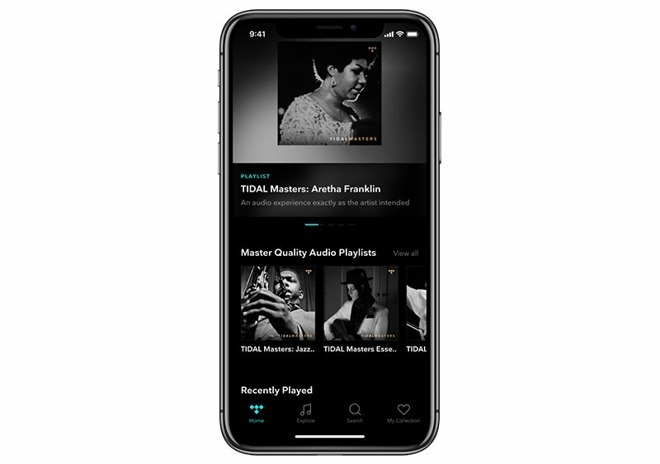 Tidal claims that MQA files are no bigger than regular HiFi, but the tradeoff is that they require more intense decoding. In fact MQA was previously limited to phones with specialized decoding chips, none of them from Apple. The HiFi tier can be tried free for 30 days with a new Tidal subscription. A standard Tidal Premium plan is $9.99 per month, though family, student, and military discounts are also available. Tidal has largely struggled to compete in on-demand streaming. While its name isn't unknown, thanks partly to a deal with Sprint, it's dwarfed by Apple Music's 50-million-plus listeners. Spotify, meanwhile, has over 87 million paid customers, and yet more people on its free ad-based tier. Tidal is typically seen as having just two advantages: HiFi and exclusives from artists like Jay-Z and Beyonce, both of whom are among the service's celebrity owners. Some others include Daft Punk, Damian Marley, deadmau5, Jack White, Madonna, and Nicki Minaj. so how do i listen to mqa audio at max quality via aac? I have to imagine the market for people who both care about this and are willing to pay for it is quite small. Having lossless audio is great, and something I wish Apple would have. But MQA - how does this make it out of the phone and to the listener? If the answer is "external DAC attached to your phone", I'm guessing the target market goes from "low" to "very, very low". I feel like the overlap of the ven diagram that shows fans of Jayz and Beyoncé with the amount of people who are dumb enough to believe they can hear the difference between a 256 kbps AAC file and these master versions is pretty small. Heck most people don’t even own equipment good enough to hear what’s available in those files. I had no idea my music could sound as full as it does until I got my HomePod, and I have a nice pair of Sony’s higher end headphones. If you really want an amazing listening experience, get Apple Music, and a couple HomePods and call it a day. Yeah, most people are happy listening to tin-can crystal AM radio. Tidal HiFi with FLAC/MQA are absolutely fantastic for who those of us who care about music and sound quality. You'll need a DAC capable of decoding MQA, like the amazing iFi xDSD. The xDSD also implements AAC over Bluetooth at a quality very close to what you'd get from a wired connection which is quite impressive. I currently pay for it, but TBH I don't notice a lot of difference with typical earbuds, only noticing the improved sound with fairly hi-end wired headphones. I may not stick with it for the price difference. Since January Tidal's Android app has contained a software decoder for MQA tracks, so essentially all Android 5.x+ smartphones become hifi devices. I too wish that Apple would offer lossless audio (I run a suite of studios, I care about audio quality, I do not own a Tidal account), but for most people they are happy with 256K AAC, and to be honest for most popular music it is a fine delivery format. I pay for my streaming services I use daily, but when I just want to dabble with things like HiFi or MQA, I just use the trials. The xDSD has great reviews. I think it's a worthy successor to the Oppo HA-2 which gave a lot of value for the money. However, I think there is some merit to listening to HiRes even without an external DAC. The iPhone's can pass 24bit/48khz through lightweight right now, which is better than what most people listen to for audio (that resolution is standard for movies). So the Tidal app could do 24/48 to some lightning-based headphones. The end result for most people -- unless they've invested heavily in VERY pricey headphones or speakers -- will be indistinguishable from "Mastered for iTunes" tracks for 99 percent of the audience. Someday there will be an algorithm that meets the needs of lossless audio while not maxing out your data allotment, but until that day comes -- enjoy Tidal while it lasts, because Jay-Z isn't going to sink cash into that money pit indefinitely. Would it make sense for Tidal to allow these tracks to be loaded onto a Fiio? The question I've always had is, can an iPhone, or an iPod Classic give the required fidelity to such HD tracks? I'm perfectly happy listening on my AirPods, but I am always interested in how far I can push the iPhone with respect to sound quality. [...] The question I've always had is, can an iPhone, or an iPod Classic give the required fidelity to such HD tracks? No. Apple devices don't support that sample rate. Don't worry about it though -- neither do your ears. 1. They do. I have Tidal FLAC and MQA downloaded on my 512GB Fiio M9. 2. They do not currently carry that hardware onboard. (The 6S is physically capable but will not be certified for MQA. FLAC will sound pretty good out of the onboard circuit, though.) To get the full experience from an iPhone you'd need a good external dac/amp like the iFi xDSD or Dragonfly Red. 3. A good pair of in-ear-monitors will change your life. I can't listen to music on AirPods. Smaller than the market for 4K/HDR? Probably but not significantly so I'd wager. There's a noticeable difference in quality between Mastered for iTunes and "HD" audio tracks with my $350 Bowers & Wilkins PX headphones. I wouldn't call $350 very pricey in today's headphone market. There's a big caveat to that statement though - the difference is only noticeable using a wired connection. Over Bluetooth, the difference is negligible. I have a pair of B&W PXs (and P7s) too. Indeed over Bluetooth I can’t tell much of a difference between an iTunes track or any of my 24bit/96 kHz ALAC ones. The only difference is that the former sound louder and fuller at any given volume compared to the latter, probably due to compression. I wish they would introduce a standardized wireless audio format that has the bandwidth to handle uncompressed or hi-res audio. Bluetooth is not it! Even if the convenience of it is stellar. Swing and a miss. HomePods are great for people that have no clue about hi-fidelity and wants something that sounds better than computer speakers. The iPod does sound better than most other similar speaker systems but they are not hi-fi devices. You want hi-gfi sound, you have to buy hi-fi gear. As an example, I have a pair of B&W 804’s, PVD-1, sub-woofer, B&W PM-1’s for surround, B&W center channel, and a Denon AVR 3400 to drive it all. This is true hi-fi quality. The HomePod is a consumer product. These comments are interesting, to me. There's a general smattering of thinking that the difference in sound quality is negligible so it is not worth the extra subscription fee, or you need very expensive audio equipment to hear the difference. Neither of these is true. I do find irony in the fact that there is a lot of 4k video out there. Apple TV 4k, downloadable 4k, ultra HD 4k disks, yet it is widely known that unless you have a 100" TV or site three feet from the screen you'll never notice the difference from 1080p. Yet those same companies, and consumers that are on the 4k bandwagon thing audio is just fine at MP3 or CD quality. What is good for the visual is good for the audio. The quality of HD music is better and I'm glad there are a few streaming services that recognize that and I'm happy to pay a bit more to get it. As for cost, you can put together a great sound system in your home for under $800 and hear the benefits of streaming Tidal Master Quatliy over anything Apple or other streaming services are providing. The Music Industry knows that the vast majority of music listeners are quite happy listening to audio of 1950's radio station quality. Let's face it, Pop music is engineered to sound best on cheap replay devices. Those listening to more demanding music set far away from the GaGa, Spears, Boy-Band / Girl-Band teen music are of minimal interest to music moguls. With very few exceptions, 21st century music has been stripped of talent. I have no data to support this hypothesis, but i wonder if human ears are more forgiving than human eyes? I'm a trained, experienced audio engineer, yet when watching content in my living room with decent quality equipment I notice video artifacts all the time, yet very rarely notice problems with the sound that are caused by bandwidth limitations. If it's true that humans are naturally more critical of visuals than audibles, it may explain why there's a broad appetite for 4K TV but not hi-res audio. That might also explain why people buy huge 4K TVs then pass the sound through cheap "Home Theatre In A Box" audio systems, or worse yet, sound bars. It's also possible that audio bandwidth compression algorithms are simply more sophisticated and effective than current video compression systems, so compressed audio actually has fewer perceived artifacts than compressed video.